Favourite express sunless tanning lotion! Invisible Tan?? is a luxurious, express sunless tanning lotion for face and body! In just? ?one application, Invisible Tan?? delivers a beautiful, believable, golden bronze glow!? ?It contains nothing artificial and is free from synthetic??ingredients. Instead, it is made with only certified organic and natural ingredients? ?sourced from Mother Nature. Our express sunless tanning lotion is also vegan and cruelty free! Invisible Tan?? express sunless tanning lotion is incredibly easy to apply! Just like you would with a moisturiser, rub Invisible Tan?? onto clean, dry skin. Our unique 'invisible' formula develops best over 8 hours. Avoid the sun's harmful rays and use our? ?Invisible Tan?? instead ??? we believe it delivers the best colour! And as a cream, it is also incredibly nourishing for your skin. ? ?It's no wonder it is a cult favourite amongst our eco tribe! It was also awarded 2016??WINNER? ?of the Natural Tanning Category in the Natural Health International Beauty Awards UK? 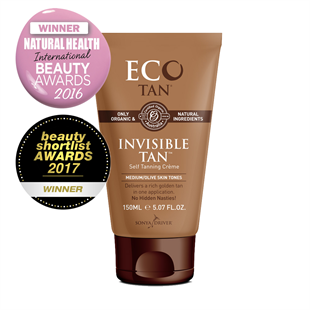 ?and 2017 WINNER of the Best Self Tanner in the Beauty Shortlist Awards.?? Beautifully nourishing gradual self tanning lotion Winter Skin?? is a nourishing, gradual? ?self tanning? ?lotion for face and body! With each application of Winter Skin, you can effortlessly build to your desired tan. It contains nothing artificial and is free from synthetic??ingredients. Instead, it is made with only certified organic and natural ingredients? ?sourced from Mother Nature. Our gradual self tanning lotion is also vegan and cruelty free! Winter Skin?? is your low fuss way to a stunning bronze glow in every season. Even if you have skin like Snow White, you can have a gorgeous sun kissed glow in a matter of days, without the sun's harmful rays! Our self tanning lotion contains a gorgeous note of organic rose geranium, so you won't smell like nasty chemical fake tans. Winter Skin?? 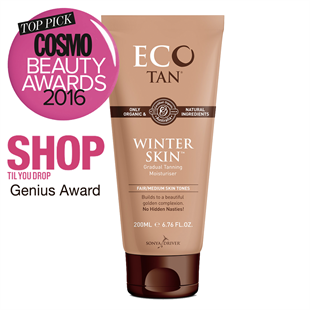 has also been awarded the Cosmo top Pick Beauty Award 2016 and the SHOP Til You Drop Genius Award! Revolutionary express self tan bronzing Cacao Mousse Eco Tan's? ?self tan bronzing Cacao Mousse? ?is your new go to certified organic product for a luxurious deep bronze tan. Without the need for the suns damaging rays! Cacao Mousse is incredibly quick and easy to apply and in just one application, you can create your ultimate deep bronze tan! 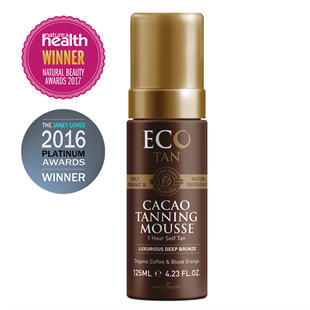 Best of all, Eco Tan's lightweight formulation mousse glides over your skin and dries quickly. Made with only organic and natural ingredients, self tan bronzing Cacao Mousse has a delicious, yet subtle chocolate scent. So you won't? ?have that nasty chemical fake tan smell! Also, you won't turn a fake looking orange colour, as our Cacao Mousse is free from artificial orange??dyes.? ?Awarded the WINNER of the Natural Tanning Category in the Nature + Health Natural Beauty Awards 2017 and Janey Loves PlATINUM AWARDS??2016. Revolutionary toner and self tanning Face Tan Water Self tanning Face Tan Water is a gradual liquid tanning toner, especially created for face, neck and d??colletage!? ?Face Tan Water builds to a beautiful glow, creates a youthful radiance and even reduces the need to wear foundation!? ?It contains nothing artificial and is free from synthetic??ingredients. Instead, it is made with only certified organic and natural ingredients? ?sourced from Mother Nature. Our self tanning Face Tan Water? ?is also vegan and cruelty free! To? ?keep that summer sun-kissed glow on your face all year round, without the sun's harmful rays, apply self tanning Face Tan Water 2-3 times a week. Since? 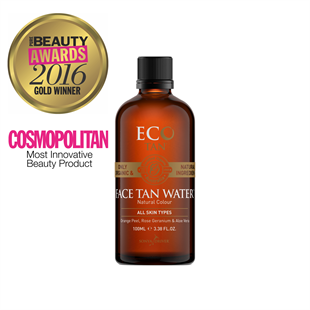 ?Face Tan Water is non-comedogenic, it is formulated to lock in moisture without clogging pores. So it's lightweight moisturising properties leave your skin feeling soft and hydrated, never greasy! Also, this revolutionary product was? ?awarded GOLD in the 2016? ?UK Pure Beauty Awards? ?as the? ?Best New Sun Care and Tanning Product! 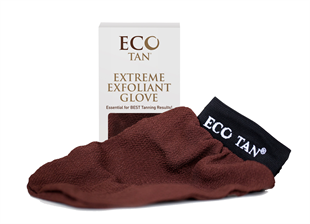 Extreme Exfoliant Glove SHARE 5 out of 5 based on 1 customer rating (1 customer review) $19.50 Quantity Add to bag Details Instructions Reviews (1) Exfoliating mitt for your smoothest skin yet Extreme Exfoliant Glove is an exfoliating mitt and absolute essential in our tanning range!? ?Our exfoliating body mitt can be used as a dry body buff, with body scrubs such as our Pink Himalayan Salt Scrub or one of our body washes to reveal your smoothest skin yet.? ?Our Extreme Exfoliant Glove? ?is a little miracle worker! It? ?can be used on ingrown hairs, flaky dry skin and rough, uneven skin. For best tanning results, it is essential that you exfoliate your skin beforehand to reveal fresh smooth skin ??? the perfect base to apply your tan. Our exfoliating mitt is the perfect tool to do so! We recommend using it with our Pink Himalayan Salt Scrub. Together this duo provide your skin with deep exfoliation and lasting hydration. Furthermore, this pair are also incredibly effective at removing old tan. Your ultimate? ?organic self tanning kit Have a gorgeous tan from head to toe with our complete self tanning kit! Choose between our award winning self-tanners based on your skin tone and preferred application. So in our tanning kit you will receive: Your? ?chosen Eco Tan organic self tanner Face Tan Water??? : our gradual liquid self tanner? ?is specifically created for face, neck and d??colletage. Also, this all natural and vegan toner delivers a youthful radiance and brightens, balances and? ?evens out skin tones. FREE Extreme Exfoliant Glove (valued at $19.95)! our exfoliating body mitt is the perfect tool to reveal fresh smooth skin ??? the perfect base to apply your tan. Choose your perfect tan! Invisible Tan?? : our luxurious, express sunless tanning lotion ???? ?best suited for medium to olive skin tones. Also, delivers a beautiful, golden glow in one application. Winter Skin??:? ?our nourishing gradual? ?self tanning? ?lotion ???? ?best suited for fair to medium skin tones. Also, builds to a sun-kissed glow with applications. Cacao Mousse:? ?our express, self tan bronzing? ?mousse ??? offers a beautiful, long lasting deep bronze colour for all skin tones. Our NEW Luxurious Double Sided TAN APPLICATOR MITT. The perfect partner for ALL our organic tans. One side for our brilliant certified organic tanning waters One side for our certified organic creams and mousse (Winter Skin, Invisible Tan & Cacao Tanning Mousse) One size fits all Professional tanning results every time Reusable Simply wash me The only mitt you'll ever have to use again! It does it all. 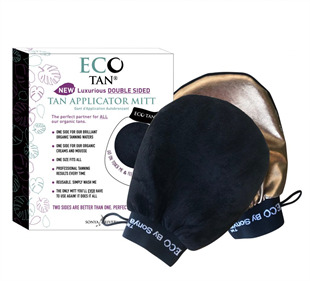 Our NEW luxurious Double Sided Tan Applicator Mitt is made from natural and recyclable fabric and material. Reusable, simply hand wash.